Today, three views by three different artists of wide open spaces. Three scenic prints of three different countries. To begin, I invite you to travel to what is most likely Shropshire , the source of the river Trent. 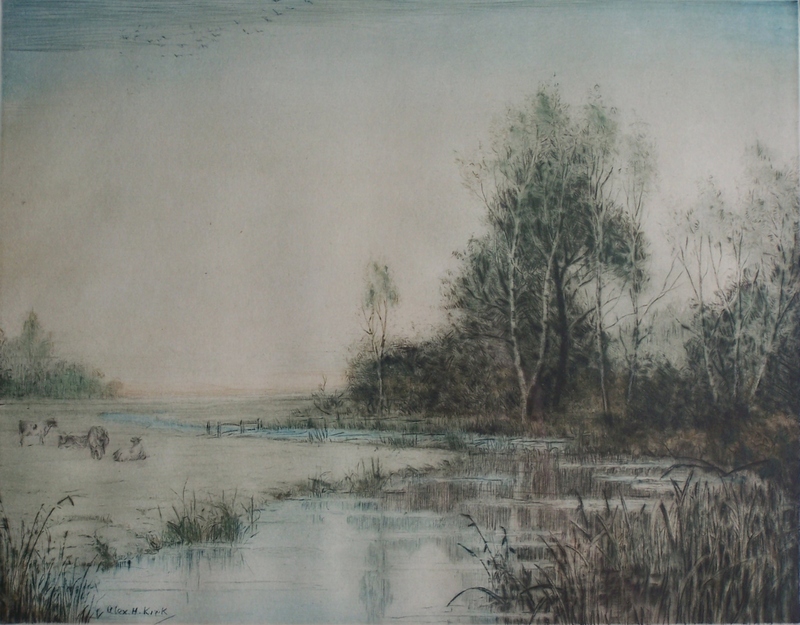 An etching done by Alex H Kirk (1871-1950). This is a wonderful pastoral scene of the Trent River as it slowly winds its’ way through the Shropshire countryside. It has a very light blue wash to accentuate the river itself and heighten the sky. 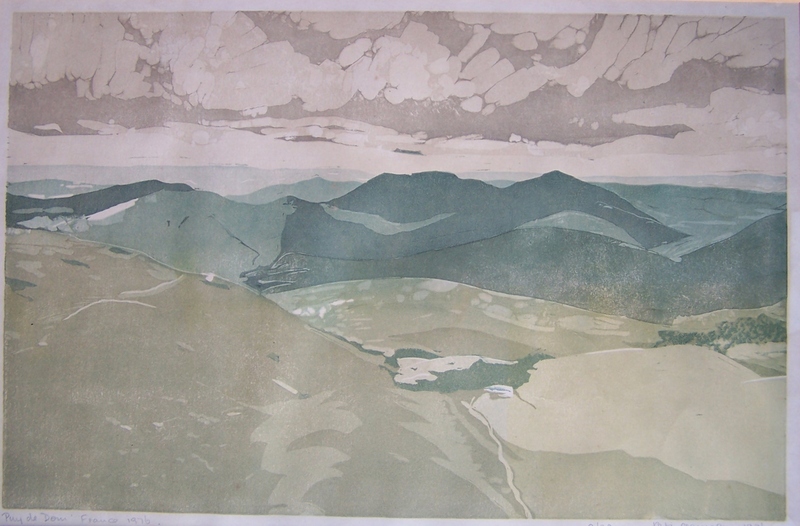 This etching so catches the calm and peace. The cattle are at rest, the trees stand unbowed by wind and the rushes reach upward toward the sky. And yet there is a sense of change coming. The birds in the sky fly in formation. Does the season change. Next the wide open spaces of a country I love to visit. Scotland is gifted with scenery which is hard to surpass. A rugged land with so much history. The ruin of Kilchum Castle stands alone on the edge of Loch Awe. A wonderfully picturesque setting. Built in the mid-15th century by Sir Colin Campbell the substantial ruins offer spectacular views down Loch Awe. What a history this place has seen. The struggle to survive and yet in the end to capitulate. A history of labour, love , and conflict. Harold Thornton (1892-1958) has captured the mighty ruggedness of the land, the placidity of the water, and the passing strength which man possesses. And finally a quick look at a place I would like to vist. ‘Puy de Dom’ in France. An extremely beautiful print by artist Katie Clemson. Shades of green colour the land, one of the youngest volcanoes found in the Auvergne (south-central France). The clouds stream over the land as once did the lava flows. The ruins of an ancient temple to the god mercury (pre-christian) have been discovered at the top of Puy de Dom. One can no longer drive to the summit. One has to either hike or take the rack railway. The summit offers expansive views of the Chaine des Puys and Clermont-Ferrand. 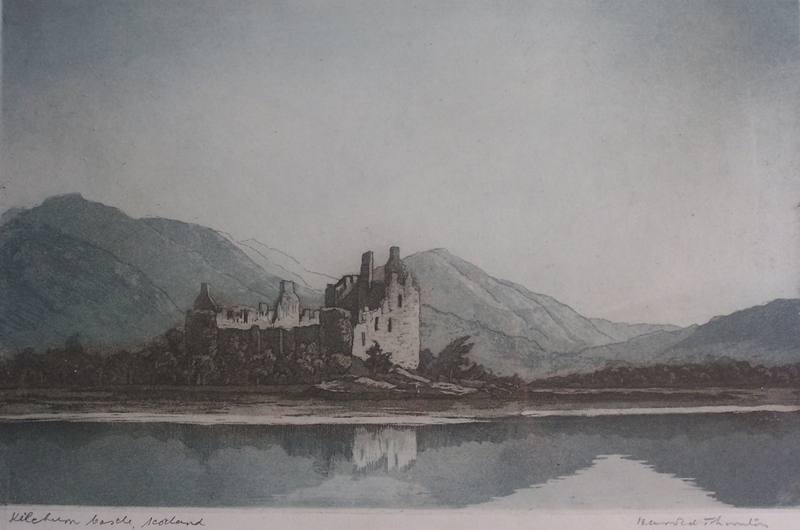 This entry was posted in Etching, Modern prints and tagged cattle, forest, Kilchum Castle, Loch Awe, mountains, Puy de Dom, ruins, Trent River. Bookmark the permalink. Would like to see your print.